Why are users getting the NPS/Feedback Survey every time they download or share? "A staff member noticed that she is getting polled every time she downloads an image ? Could you please have a look - originally it was set to be every three months or so and that sounds like a good time frame." The Staff Member's last response (to the NPS survey) was on 16th August 2017. Your account is set to run the NPS Survey every 90 days (90 days after the last response of the individual user). So if the Staff Member responds again it will be another 90 days until she is asked again. If she does not respond again - she'll will be asked every time she Downloads, until she does. I suspect she responded only in August and not since. Why is it setup this way? Asking for an NPS response regularly - say every 90 days is important to measure "current sentiment" as it can change over time, even for individual users. 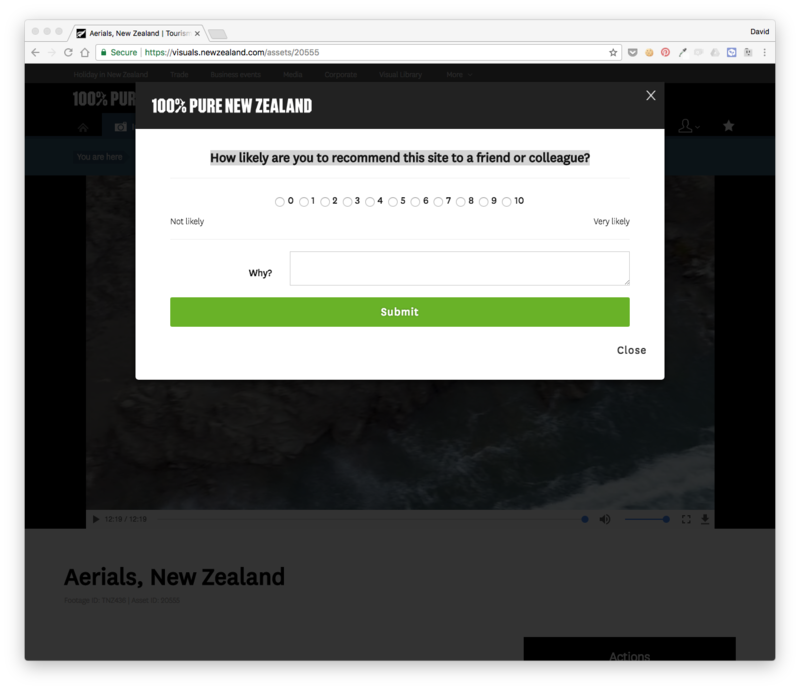 the NPS Survey (or Feedback) form is on by default for all accounts - but can be turned off by requesting Brandkit Support to make the change for you. The NPS Survey wait period is the wait-period in days between surveys for individual users. If turned on, the survey is shown to user every X days after their last response to the survey. Title - How likely are you to recommend this site to a friend or colleague? is the default but can be modified with supplied text. Ask Why - ON by default or Off by request - Text box response only. Optional second question - Off by default. On by supplying the question text. Note Text box response only. Score is alway 1-10 - not editable. Is presented immediately after Downloads and Shares if ON. User can close survey without responding but we will ask for a response every time (once wait period is passed) until the user responds if ON. The individual response to the survey are recorded against the users account, visible in the Manage Users view and on individual User Accounts. This is updated each time the User responds. 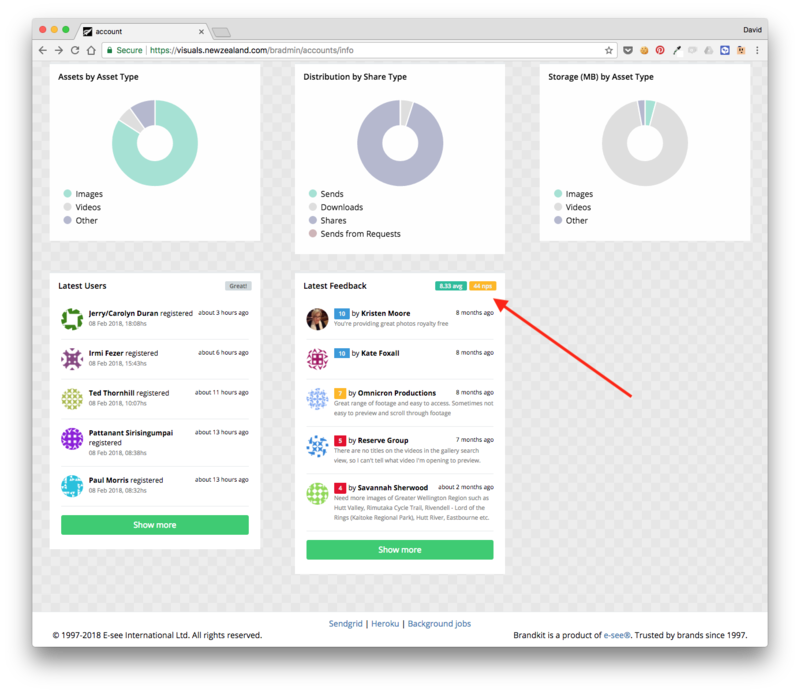 An aggregated NPS Score and Average Feedback score is then shown for the Account in the Account Statistics/ Dashboard as seen above. You can also click through for more detail with the [Show More] button.